Traditionally, many household septic tank systems have had a reputation for causing bad smells, foul runoff and general nuisance, not to mention pollution of stormwater, creeks and beaches with significant ecological and economic impacts. An inappropriately designed or located onsite system can also lead to possible slope instability problems, such as erosion and landslip; fortunately this is a rare occurrence but if it happens to you, it may be a very costly experience. A properly constructed and managed wastewater system need not be like this and modern design practices should minimise these risks. 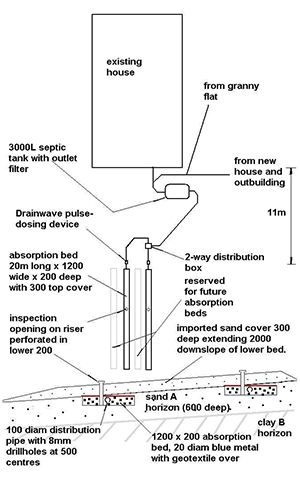 These days, there is a bewildering choice of different systems available, including traditional septic tank systems, waterless composting toilets with greywater treatment to modern aerated package (“active”) plants and more recently, innovative designs which incorporate hybridised features to combine the benefits of both passive and active systems in terms of minimal maintenance and improved effluent quality. All onsite systems rely on the soil as the ultimate treatment and disposal medium, so a competent assessment of site capability is vitally important. The best system for a site will always be dependent on a range of factors, including soil types and depth, site topography and climate but also (and very importantly) the needs and preferences of the homeowner. Good advice in this area is essential as there is no one size fits all solution; all sites are different and all require an individual solution, tailored to the needs and expectations of the client. A good onsite wastewater management consultant must also be able to identify and anticipate the likely issues of concern to council regulatory staff and ensure that your design has sufficient safeguards to address these concerns, so smoothing the way for your project through the development approval process and more importantly, protect your investment and your local environment. As principal at Onsite Assessments Tas, I have over 25 years experience as a designer, assessor and regulator of wastewater systems servicing everything from individual houses on acreages, houses and holiday homes in beachside townships, tourism developments, mine sites, rural businesses, sports clubs etc. As well as operating a private consultancy since 2004, I also worked from 1989 as a local government Environmental Health Officer in primarily rural councils on Tasmania’s East Coast, Huon Valley and South East, before moving into full-time private practice. During my time in local government, I had a close involvement in both regulation and policy making, so I bring with me a strong awareness of the whole approvals process. I am well placed to provide appropriate design advice and to steer your proposal through the often complex regulatory environment, to ensure a smooth passage through the approvals process and minimal delay in obtaining that vital permit. I am an independent designer and whilst maintaining good relations with the various industry players and Council regulatory staff, I have no links or association with any supplier or system installer; my only focus is on ensuring that your house or development has an onsite system that best suits YOUR needs and requirements.